A confession. Grocery stores frighten me. I’ll go to Trader Joe’s and Whole Foods, no problem. But a place like Meijer– with aisle after aisle of far too many choices for any single item, just makes me nervous. So it was with a bit of trepidation that I joined a recent Shopping Matters class for bloggers, hosted by the folks who run CookingMatters. The latter is an amazing program that teaches low income and food insecure people how to cook, shop, and get the most bang for their grocery buying buck. · Turkey bacon has just as much fat as regular bacon, and you’re really better off just eating regular bacon—trust me on this one. After our tour, we were dispatched on a mission—spend $10 (and not a penny more) on groceries to provide a healthy meal for a family of four—hitting all five food groups. Lucky for me, I came with a recipe in mind. The trick was whether or not I could stretch those dollars to buy all the ingredients I needed. 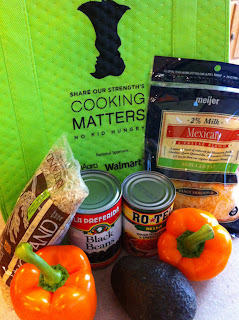 Here’s what I bought: A bag of brown rice, two large orange peppers, one can each of black beans and diced tomatoes with green chilies, one bag of shredded cheddar, and an avocado. I came in at $9.71, (FTW!) and I’ll make Southwest style rice and beans stuffed into orange pepper halves, with some avocado slices on the side. See a future blog post for specifics. 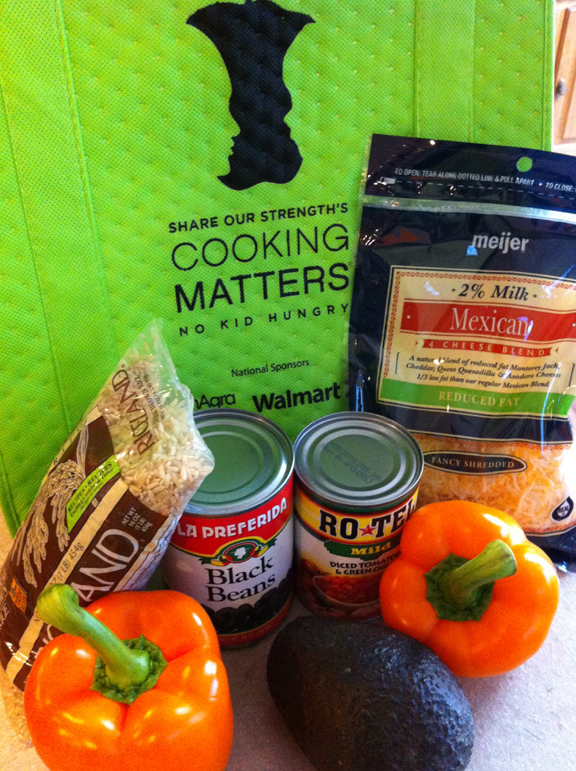 Share Our Strength’s Cooking Matters™ is a nationwide, groundbreaking nutrition-education program that teaches adults and teens how to prepare healthy, tasty meals on a limited budget. In Michigan alone, Cooking Matters reached more than 1600 participants through 132 courses last year. That’s a lot of people learning to cook and eat healthy! Through Cooking Matters, professional chefs and nutritionists volunteer their time and expertise to lead hands-on courses that show participants how to purchase and prepare nutritious foods in healthful, safe and tasty ways. Cooking Matters Michigan is part of a national program, and partners locally with Gleaners Community Food Bank, in Detroit. Cooking Matters is seeking volunteers. For more information, contact Vani Sohikian, MPH, at 313.923.3535, ext. 202, or email her at vsohikian@gcfb.org. You can also connect with Cooking Matters on Facebook and Twitter.